Census Bureau report shows percentage of vacant houses available for sale and of Americans who own homes were relatively unchanged in 2nd quarter. NEW YORK (CNNMoney.com) -- The percentage of vacant homes available for sale remained relatively flat in the second quarter, but still hovered in record territory. Some 2.8% of homes, excluding rental properties, were empty and on the market from April through June, according to Census Bureau figures released Thursday. The vacancy rate hit a record high of 2.9% in the first quarter of 2008. It was 2.6% a year ago. "They are still not showing a downward trend," said Christian Menegatti, U.S. lead analyst at RGEMonitor.com, an economic research and consulting group. "That's the bad news. The numbers are telling us that prices have to fall more." Just under 2.2 million empty homes were for sale in the most recent quarter. The vacancy rates for homes built in April 2000 or later was 9.8%, more than triple that of houses constructed earlier. Builders capitalized on the boom in home prices and demand earlier this decade, Menegatti said. Many of those houses now are standing empty. "There was a lot of reckless construction exploiting the fact that prices were going up," he said. "Suburban areas were flooded with new construction in locations that were commuter-unfriendly. Now those are suffering the most." The South had the highest vacancy rate at 3.2% and the Northeast had the lowest at 1.9%. The West had the largest year-over-year jump, to 2.8% from 2.3%. That doesn't surprise Dean Baker, co-director of the Center for Economic and Policy Research. "The West has been hugely hit by the collapse of the California housing market," Baker said. "That's ground zero of the meltdown." The nation's homeownership rate, meanwhile, also stayed relatively stagnant at 68.1%., up slightly from 67.8% in the first quarter and down from 68.2% in the year earlier period. But the rate is lower than the high of 69.2% at the end of 2004. The housing market is likely bleaker than the Census figures show, said Robert Dye, senior economist for PNC Financial Services Group. Other reports showing rising inventories, weak home sales and soaring foreclosure rates paint a picture of a very weak housing market. "The Census numbers are not really reflecting what's going on," Dye said. The Census statistics are just the latest in a grim parade of figures showing the implosion of the housing market nationwide. In a separate report released Thursday, sales of existing homes slowed more than expected in June while inventory increased, according to the National Association of Realtors. Sales by homeowners fell in June to an annual pace of 4.86 million, down 2.6% from May and 15.5% from June 2007. The median price of a home sold during the month fell to $215,100, down 6.1% from $229,000 a year earlier. Earlier this month, RealtyTrac said that 343,159 Americans lost their homes in the first half of 2008, up 136% from 145,696 in the same period a year earlier. Congress and the Bush administration are scrambling to stabilize the troubled housing sector, which is roiling financial markets worldwide. 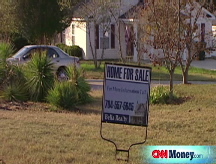 The House on Wednesday approved a bill offering up to $300 billion in assistance to strapped homeowners. Lawmakers also approved Treasury Secretary Henry Paulson's plan to back mortgage finance companies Fannie Mae and Freddie Mac. The Senate is expected in coming days to take up the legislation, which President Bush has said he will sign. Still, the country's economic woes are slowing any revival in the housing sector, said Asha Bangalore, economist at Northern Trust Co. She said it's tough for Americans to buy or keep their homes if they don't have jobs. "The employment situation has to turn around for the housing market to turn around," Bangalore said. "You can't have the unemployment rate going up and have this market turn around."